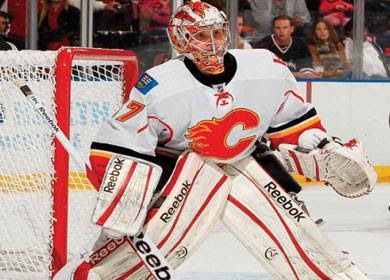 The Pittsburgh Penguins have invited Leland Irving, a former first round pick of the Calgary Flames, to training camp. Irving has 11 years of professional hockey experience. Of the 13 games he's played at the NHL level, he's 3-4-4 with a 3.25 goals against average and a .902 save percentage. He's spent his career in the NHL, AHL, ECHL, and the Finnish Elite League. With the invite, Irving is one of six goalies that will be attending the Pens' training camp. The others include Doug Carr, Casey DeSmith, Tristan Jarry, Marc-Andre Fleury and Matt Murray. Sean Maguire and Filip Gustavsson are not attending camp, according to the Penguins training camp roster. Gustavsson, a 55th overall draft pick by the Penguins in 2016, is currently on Luleå Hockeyförening of the SHL, and their season starts tomorrow. This is likely why he won't be attending camp. Maguire, a 113th overall draft pick by the Penguins in 2012, is not attending camp and his spot is being taken by Casey DeSmith. As of now, a reason has not been given for his absence. He didn't play in London during the rookie tourney, so the safest guess is injury. But nothing has been confirmed.